Today the 30th Plenary meeting of the Missile Technology Control Regime has begun in the Korean city of Busan. Delegations from the 35 MTCR members were welcomed by Acting Foreign Minister Lim Sungnam of the Republic of Korea. 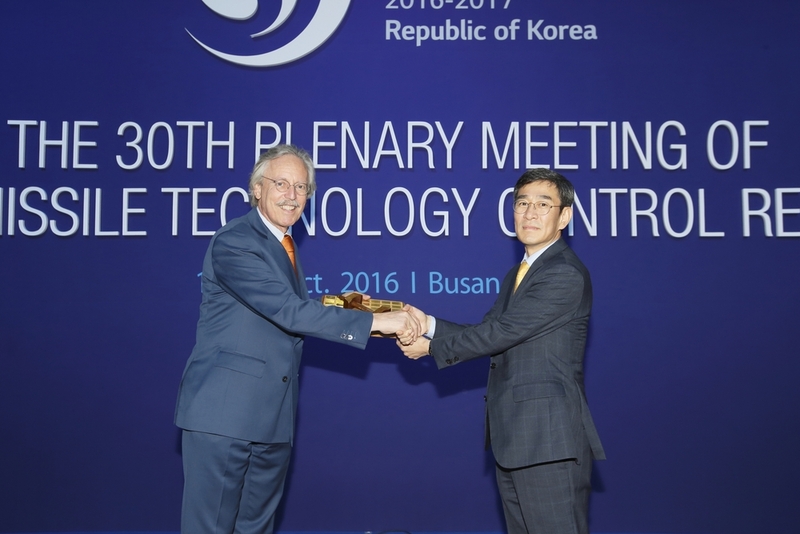 Thereafter, outgoing MTCR Chair Ambassador Piet de Klerk handed over the gavel to the Director-General Sang-wook Ham, who will be the new Chair until the 2017 MTCR Plenary. This event marked the end of the joint Netherlands-Luxembourg chairmanship that begun at the 2015 Rotterdam Plenary meeting. 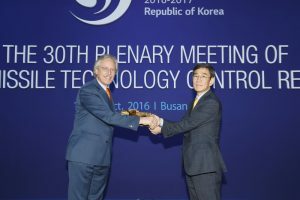 Around 300 delegates convene this week in Busan to discuss a wide range of MTCR-relevant topics, both at expert as well as at policy level. The MTCR Equipment, Software and Technology Annex will also be revised. The new version will eventually be available on www.mtcr.info.